Sorry for the delay. 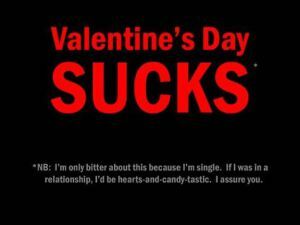 So the main vent today is ‘Valentine’s? Bah humbug’. A day which used to be used to celebrate the love of young lovers has become so commercialized and have been made into a spectacle which, though great for people in relationships most times, makes for agonizing awareness for the singles around them. The public displays of affection in the way of flowers, candy, etc… It’s like saying ‘I’m getting rewarded for being in a relationship. You can’t hold one so nothing for you.’ Now how fair is that? 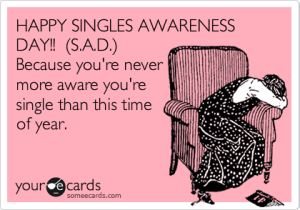 So Dustin Barnes from Mississippi State University started the Single Awareness Day movement because I mean when else do unrelated people feel more aware of the fact that they are single than on the day to celebrate relationships.